For a thrilling adventure in Queenstown, be sure to pick up your car rental at Queenstown Airport. We at VroomVroomVroom can help you find the perfect car hire for your next trip by comparing rental cars from major suppliers such as Avis, Hertz, Budget, Thrifty and Europcar. Considered as one of the fastest growing airports in Australasia, Queenstown Airport welcomes many visitors through its doors all year round. It is the fourth busiest airport in New Zealand and is heavily used for flightseeing. Great rates: To save money, compare all current Queenstown Airport car hire rates through our system. If you book as early as possible, you may be surprised at the great rates you can secure. Wide selection of vehicles: There are plenty of cars to choose from in Queenstown and should you prefer to explore the city and Central Otago by campervan, we can help you with that too. Easy and quick: Our advanced booking system allows you to compare, choose a car, add extras and book in a few minutes. Trusted since 2001: We have been helping people book a car hire for more than a decade. Don't hesitate to contact us if you need assistance. Travel time from Queenstown Airport to the centre of town is approximately ten minutes by car. Please note that Queenstown is surrounded by a small number of scenic towns. From there, you can explore and drive to Arrowtown, Cardrona, Cromwell, Glenorchy and Kingston. First time drivers should remember that cars in New Zealand must keep to the left side of the road. Many roads include varying conditions and can be narrow, windy and cover hilly train. Click here for more driving tips in Queenstown. The airport is not just the gateway to Queenstown itself, but the whole Wakatipu and Central Otago region. In fact, There are numerous incredible places to drive to in your rental car, but we've picked only the best. Check it out below. World-renowned glass artists Ola Hoglund and Marie Simberg-Hoglund opened their Central Otago gallery in December 2015. It is set on a terrace overlooking the Clutha River, amongst the vineyards of Central Otago countryside. Call in to view paintings, art glass and glass jewellery. 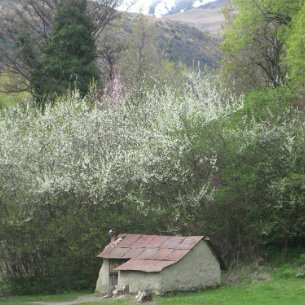 The character-filled and historic village of Arrowtown is just 15 minutes' drive from the airport. It is home to the Lakes District Museum, which has interactive displays of the history of Arrowtown, particularly the lively days of the gold rush. Be sure to hire a pan from the museum, and head outside to try your luck panning for gold nuggets in the Arrow River. There are fantastic restaurants in Arrowtown, as well as Dorothy Brown's boutique cinema, bar and bookstore, rated as one of New Zealand's finest independent cinemas. Grab a hire bicycle, and explore some of the sensational trails available, such as the Arrow River Bridges ride. This 16 km trail zigzags over 5 bridges, and tunnels under a major state highway to take you past AJ Hackett's famous bungy jump. It finishes in the Gibbston Valley, home of Central Otago wines. The luxury golf resort and spa of Millbrook is near Arrowtown. Another gorgeous lakeside community, with the best access to Cardrona and Treble Cone skifields. The Gibbston Valley was the first area in Central Otago to start making wine. 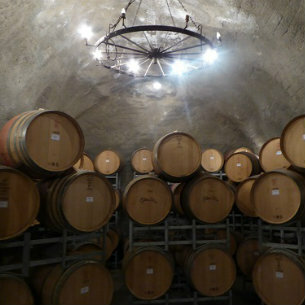 There are now 11 wineries in the narrow valley, many offer tastings and cellar-door sales. Be sure to tour the wine-cave at Gibbston Vallley Wines, and drive the challenging road into Chard Farm to taste their Pinot Noir. Glenorchy and the Dart River are around 50 minutes travelling time from Queenstown Airport. The Dart River flows deep into the Mt. Aspiring National Park, and is true 'Lord of the Rings' country. Experience something unique with a Funyak safari! A funyak is an inflatable canoe, and tour guides will accompany you to drift peacefully on the river, as well as to explore hidden streams, rock pools and deep chasms. The trip can be combined with a Dart River jet boat ride. Alternatively, book a horse riding adventure with Dart River stables, another way to see incredible countryside from a unique perspective. The town of Cromwell sits on beautiful Lake Dunstan, a 45 minute drive from Queenstown Airport. Visit Cromwell's unique historic precinct, formed when the Clyde Dam was completed in 1990. Cromwell's main street disappeared under Lake Dunstan, but many of the historic buildings dating back to the gold rush of the 1860s had been saved and rebuilt on higher ground. The Highlands Motorsport Park is a new attraction for Cromwell that offers something for everyone. You can tour the racetrack in a Porsche Cayenne Turbo, 'The Highland Taxi'. The tour consists of two laps, the first is an informative tour, the second is at speed! Or you can try your hand at go-karting or visit the Motorsport Museum. Of course, there is plenty to do in the town of Queenstown itself. Cruise Lake Wakatipu, or enjoy the nightlife. Check out our Queenstown guide of things to do, places to stay and places to eat. Feedback: Hi Guys, very easy booking process. Although, would like a confirmation that snow chains will be in the vehicle as we will be visiting the ski areas. Kind Regards, Geoff Gordon. Alamo Queenstown Airport - Serviced By Enterprise Sir Henry Wigley Drive, Queenstown, SI. Avis Queenstown Airport - Terminal Building, Queenstown, SI. Budget Queenstown Airport - Terminal Building, Queenstown Airport, Queenstown, SI. Europcar Queenstown Airport - Queenstown Airport, Frankton, Queenstown, SI. Enterprise Queenstown Airport - Terminal Building, Sir Henry Wigley Drive, Queenstown, SI. Hertz Queenstown Airport - Terminal Building, Sir Henry Wigley Drive, Queenstown, SI. National Queenstown Airport - Serviced By Enterprise Sir Henry Wigley Drive, Queenstown, SI. Thrifty Queenstown Airport - Terminal Building, Airport Desk, Queenstown, SI.